Situated in the City of Westminster, between Fleet Street and Trafalgar Square, The ‘bustling’ Strand thrives with visitors in restaurants, art galleries, shops and theatres. The Courtauld Gallery and Somerset House boast interesting architecture, art and artefacts, as well as a popular outdoor ice rink in the winter at Somerset House. With many of London’s famous West End theatres on its doorstep, ample restaurants and bars are perfect for pre-theatre drinks or dining. Savoy Grill by Gordon Ramsay has two private dining rooms seating up to 8 and 40 guests. The restaurant itself is available for exclusive takeover for up to 100 seated (200 standing) guests. The two private dining rooms at The Delaunay in Adwych accommodate up to 8 and 14 seated guests or 24 on a single table when combined. The Admiralty is a Fuller’s pub located slap bang in the middle of Trafalgar Square in the centre of London. 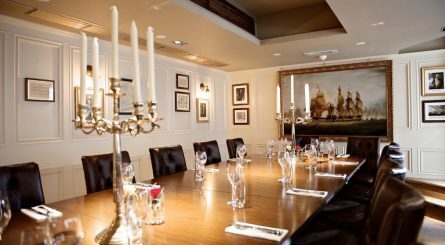 The private dining rooms at The Admiralty can accommodate 16 – 100 seated guests or 25 – 150 guests for standing drinks receptions.